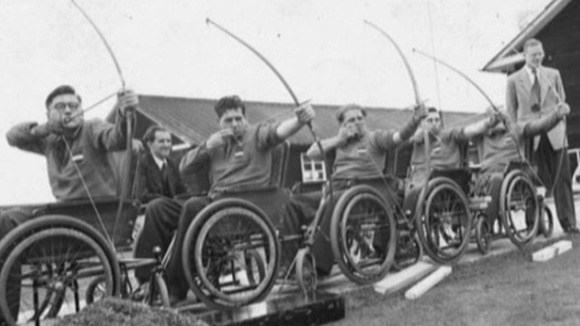 It is amazing to think that the Paralympic Games had their humble beginnings just over sixty years ago, in Stoke Mandeville Hospital in Aylesbury, England. the “Father of Sport for People with Disabilities,” Dr. Guttmann was a strong advocate of using sports therapy to enhance the quality of life for people who were injured or wounded during World War II. Dr. Guttmann organized the 1948 International Wheelchair Games to coincide with the 1948 London Olympics. His dream was of a worldwide sports competition for people with disabilities to be held every four years as “the equivalent of the Olympic Games.” Twelve years later, his dream became a reality. The first Paralympic Games were held in Rome, Italy, in 1960 and involved 400 athletes from 23 countries. Originally, only wheelchair athletes were invited to compete. Since that time, the Paralympic Games have grown dramatically. The present-day Paralympic Games include five major classifications of athletes: persons with visual impairments, persons with physical disabilities, amputee athletes, people with cerebral palsy, people with spinal cord injuries and Les Autres - athletes with a physical disability that are not included in the categories mentioned above (e.g., people with Muscular Dystrophy). The Paralympics are held in two seasons: summer and winter. Athletes with disabilities have been competing in the Winter Games since 1976. Sweden hosted the first Winter Games, which included 12 countries competing in Alpine and Cross-Country Skiing events. Initially the Paralympic and Olympic Games were implemented at different times, but in 1992 the approach was modified. Now the Paralympic and Olympic Games are held within two weeks of each other using the same venues and the same organising committee. Sir Ludwig Guttmann died in 1980, but his vision of sport for athletes with disabilities continues today. Clearly the value of sport in the lives of athletes with disabilities extends far beyond its rehabilitative benefits. Sportsmanship, camaraderie and an active lifestyle are other important benefits. The athletic talents of competitors with disabilities are becoming recognized worldwide, just as Dr. Guttmann intended. The skill and talent of high-performance athletics and competition are evident in the performance of today’s Paralympians from all nations.